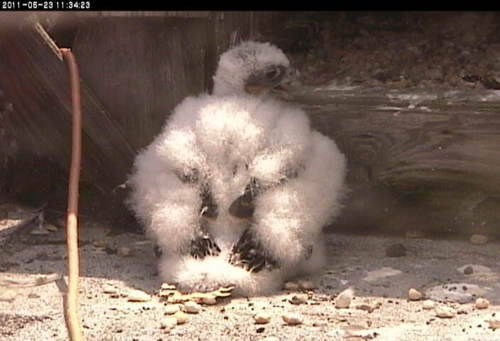 The nestling peregrine falcon in Richmond is thriving. As the sole beneficiary of the hunting efforts of both adults, this young bird is certainly well fed. In the photos below you’ll note that wing, tail and even some body feathers are beginning to become apparent. On Saturday, May 21 the young bird hopped out of the nest box and began to explore the ledge. The adults continue to feed the bird and there a number of areas on the ledge where the chick can find shelter from the sun or inclement weather, the chick is also able to get back into the box if it wishes. At times the chick may be out of camera view. On Wednesday May 25 DGIF biologists will access the ledge and band this chick. The bands will help us track this bird throughout its life. This will provide valuable data as to how these birds disperse when they leave the nest. At the same a pen will be assembled and fitted to the nest box. The chick will be returned to this enclosure where the adults will continue to feed it.